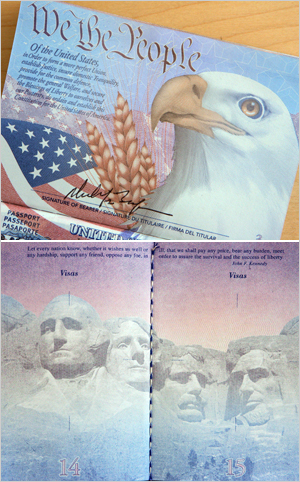 The newest version of the American passport befits our international reputation as the least subtle of nations. It’s got a bald eagle emblazoned across the front page, and every page thereafter boasts an equally AMERICAN subject: Cowboys! The Liberty Bell! Grizzly bears! Mount Rushmore! It’s like they asked Clint Eastwood to cry on a few pieces of paper and then scanned the results. But Europeans love the damn thing, in all of its red, white, and blue glory. Once at a hotel, the guy checking me in paged through the whole booklet to look at all of the pictures while he was supposed to be copying my ID page, flashing it at his colleague with an impressed raise of the eyebrows. They agreed it was quite snazzy. “It’s beautiful!” more than one person has scolded me when I’ve sheepishly opened it and muttered my embarrassment. Recently I even thought I overheard a couple coveting its colorful pages as they looked over my shoulder in line to board a plane. The international vote is in, and it seems they’ve got passport envy. This American finds it a little tacky and over-the-top. You? I completely agree with you! They are so tacky. Every time I bring mine out I get a little embarrassed. Not that I don’t like my country, but please, for once can we try to not be so over-the-top? Please?